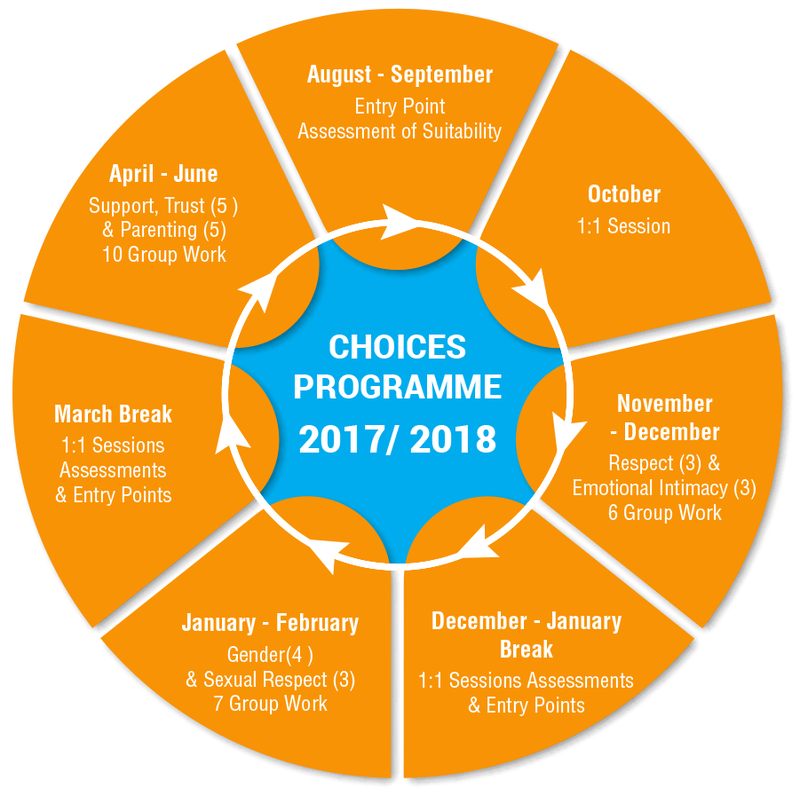 The CHOICES programme is run as a rolling programme to allow men to access the programme at three intervals. The programme is a group work intervention giving men a chance to learn about the impact of their destructive behaviour on the family. It also supports them to develop the necessary skills to live non abusively. Individual sessions supplement the group work and occurs at the beginning, during and after the programme. The diagram below indicates the timeframe for 2017/18. Men will be brought on to the programme if existing participants cease their engagement with MOVE or if initial numbers starting the programme are low. Learn about the effects and consequences of domestic violence on their partner and family. Participate in group sessions with other individuals who have behaved in a similar way. Talk openly about their behaviour and the people affected by it. Identify the beliefs and attitudes which underpin violence and abuse. Cope with their behaviour and feelings in difficult situations. Learn how to react without being abusive. Learn about respect and responsible parenting. Learn to understand and recognise the need to change their behaviour.